The Ondine pedestal sink from Renovator's Supply features a compact design and sleek lines to keep your bathroom spacious and beautiful. - The Ondine is a space-conscious pedestal basin sink. - Open-back sink pedestal sinks save space in your bathroom and make installation a breeze. - OVERALL: 33” Tall x 16” Wide x 14” Proj. - BASIN: 5” Deep x 13” Wide x 9” Proj. 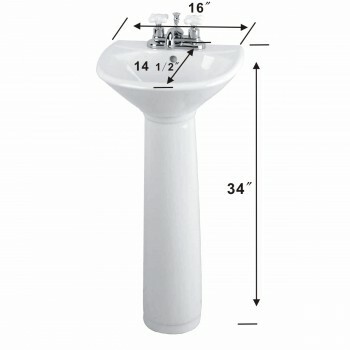 - Accepts an 4” centerset faucet (not included). - 1-3/4"" drain hole (not included). - Design Inspirations: Space saving designs and luxurious modern bathrooms.